The wonderful occasion known as Purim, which starts on 20th March, 2019, commemorates the deliverance of the Jews in Persia from their evil royal advisor Hamman about 2,500 years ago. Observed annually on the 14th of the Jewish month of Adar, the festival consists of reading the Book of Esther, gift-giving, charitable activities and of course, joyous merrymaking and feasting. Add to your Purim celebrations by taking a merry trip through our grand section dedicated to this beautiful festival. Go through the history of the occasion, wish your friends and loved ones with cute e-cards linked to the event, check out the recipes, jokes, craft ideas related to the festival and more. If you like our Purim section and want to refer it to your dear ones, just click here. 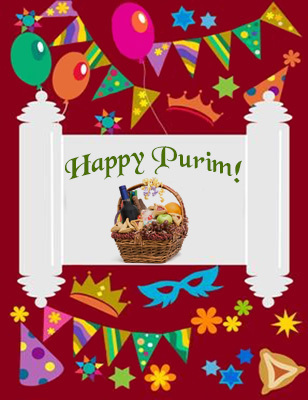 "Purim Sameach" to you all from TheHolidaySpot! Know how the festival came into existence and the reason behind its celebration. Send festive greetings and wish happiness to friends and loved ones with cool e-cards linked to the occasion. Set these free, exquisite wallpapers themed to the Purim festival on your PC screen or send to dear ones. Treat yourself and your loved ones to sumptuous culinary delights using these stepwise cooking instructions. Make the festive time a memorable one for your dear ones with these wonderful presents. Check out these rib-tickling jokes and have a fun-filled time during the holiday. Get to know how Purim is celebrated and about the exclusive customs that chiefly associated with Purim. Enlighten yourself with some fascinating facts; get to know about how modern days still echo with the elements of Purim. Test your knowledge on Purim with this exciting quiz game themed to the occasion. Read these stepwise instructions and construct wonderful crafts at home to gift to your loved ones on Purim. Celebrate Purim with this fabulous collection of free downloadable songs related to the festival. Print out attractive images related to the festival and paint them in the colors of your imagination. Know all about Hanukkah, one of the other joyous and significant Jewish festival.